Last January, news broke out that Jordan Brand will be releasing a “Gold Medal Pack” related to the much-anticipated 2012 London Olympics. This Gold Medal Pack includes the Air Jordan 7 “Gold Medal”, which looks very promising. 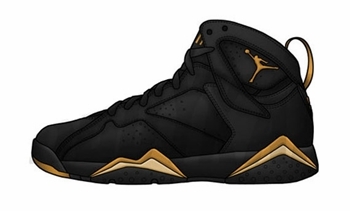 No actual image of the shoe has been seen, but an official sketch of the shoe came out, which shows the silhouette that features a black upper part enhanced with gold touches all over the shoe. This is expected to be released on August before the 2012 London Olympics. We will keep you updated!